Apple tart is the ultimate when it comes to home cooked desserts. It’s comfort food that brings back memories of childhood and cosy family dinners. Who can resist a slice of hot apple pie smothered in delicious custard on Sunday after Sunday dinner? 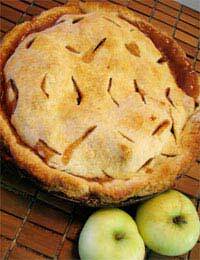 In winter especially nothing beats a delicious apple pie. Sweet, flaky pizza stuffed with hot, juicy apples and covered in creamy custard – no wonder it’s one of the nation’s favourite desserts. This apple pie dessert is gluten free and absolutely delicious. It serves four but if you’re not having people over or cooking for the family but you just fancy making yourself a treat then you can always make the pie for four and then freeze the rest. It’s perfectly ok to freeze this pie. Alternatively if you are having people over or you are cooking for a big family then you can double the ingredients and make this recipe serve eight. It’s so delicious that even if you are just cooking for four your diners might want seconds! one egg and one tablespoon of cold water. To begin with peel, core and slice the apples and preheat your oven to gas mark 6 or 200ºC. It’s best to start by making the filling as it will need time to cool – which it can do while you make the pastry. Take the apples and place them in a bowl with the three tablespoons of water. Cover the bowl and place in the microwave. Cook for two or three minutes. By this time they should be soft and cooked but not too sloppy. Remove the bowl from the microwave and set aside. Now for the pastry. Take half of the powder mix and add to a bowl with the butter, egg and water. Mix until all the ingredients blend to form a paste with no lumps. Use a hand whisk or a fork for best results. Add the rest of the powder mix and stir in to combine with the paste. Now it’s time to get messy! Using your hands (obviously wash them first!) mould the mixture into a ball. Take it out of the bowl and knead on a lightly dusted surface with a bit of force until it is smooth. Roll the pastry flat with a rolling pin. Cut about a third off and set aside. Now line a loose base flan tin with the pastry and add to the tin your apple mixture. Sprinkle the cornflour and sugar onto the mixture and brush the rim of the pastry with the water. Take the pastry you put aside and cover the tin, to act as a lid for the pie. Pinch around the rim of the pastry to secure the ‘lid’. Bake the pie in the oven for around 20 minutes until pastry is lovely and golden. When serving though remember the filling will be extremely hot so be careful! This is the perfect dessert to serve on a winter’s evening and will be the perfect ending to any dinner party. It’s easy to make, gluten-free and absolutely delicious!